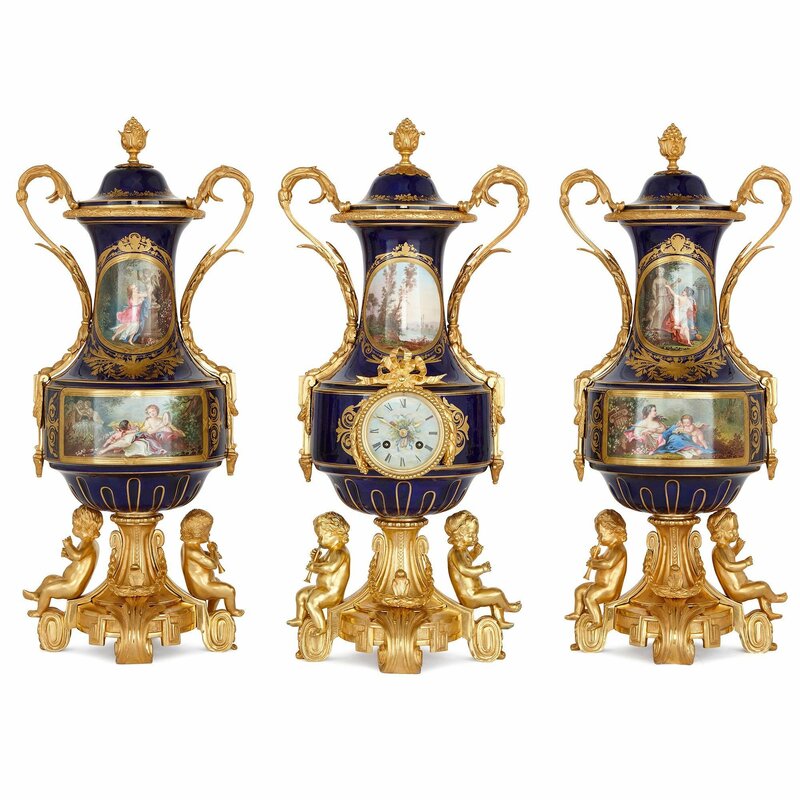 The three piece clock garniture is of unusual design, in that the pair of flanking vases are of identical shape and size to the central clock. 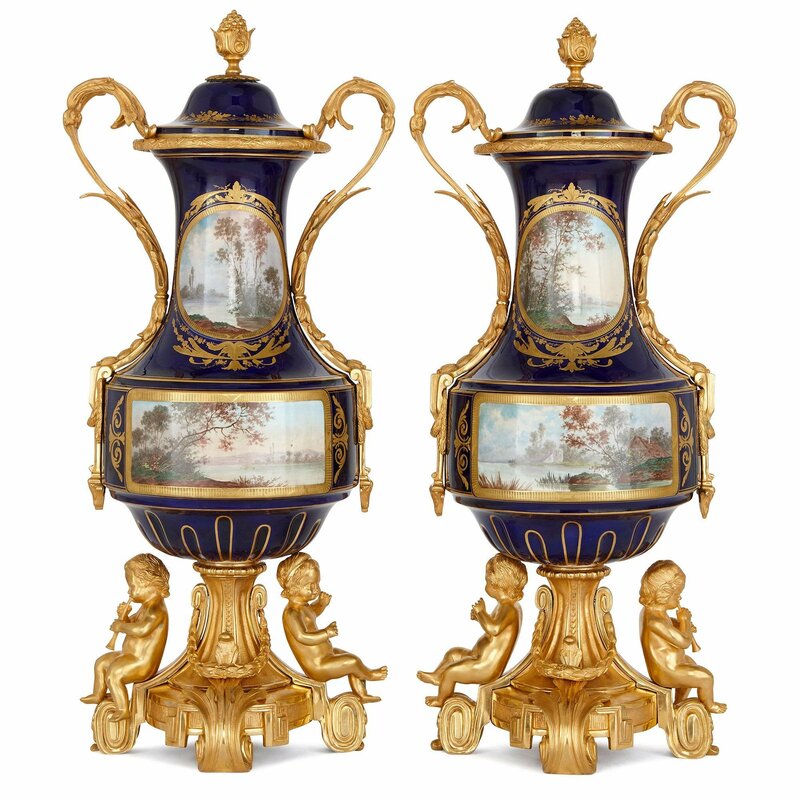 Crafted in Sevres style porcelain and mounted extensively with ormolu, this set would make a striking addition to any luxury interior. 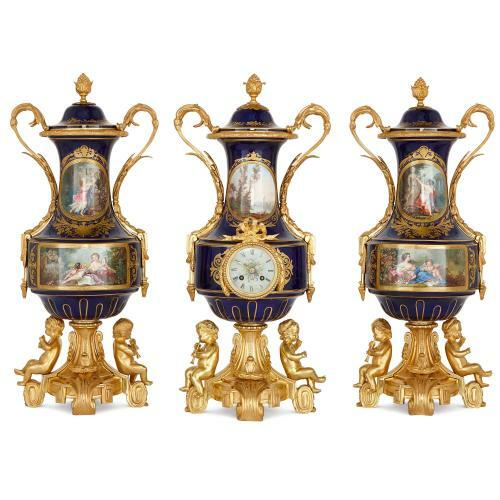 The garniture comprises three, large, baluster-form vases, which are coloured with a majestic, royal blue ground. They are all decorated with charming, Watteauesque painted scenes of 'fêtes galantes' to the front, and painted landscape scenes to the reverse. All of the painted panels are surrounded by intricate gilt cartouches. Each vase is surmounted with an ormolu pine cone finial, and mounted with twin acanthus leaf handles in ormolu. 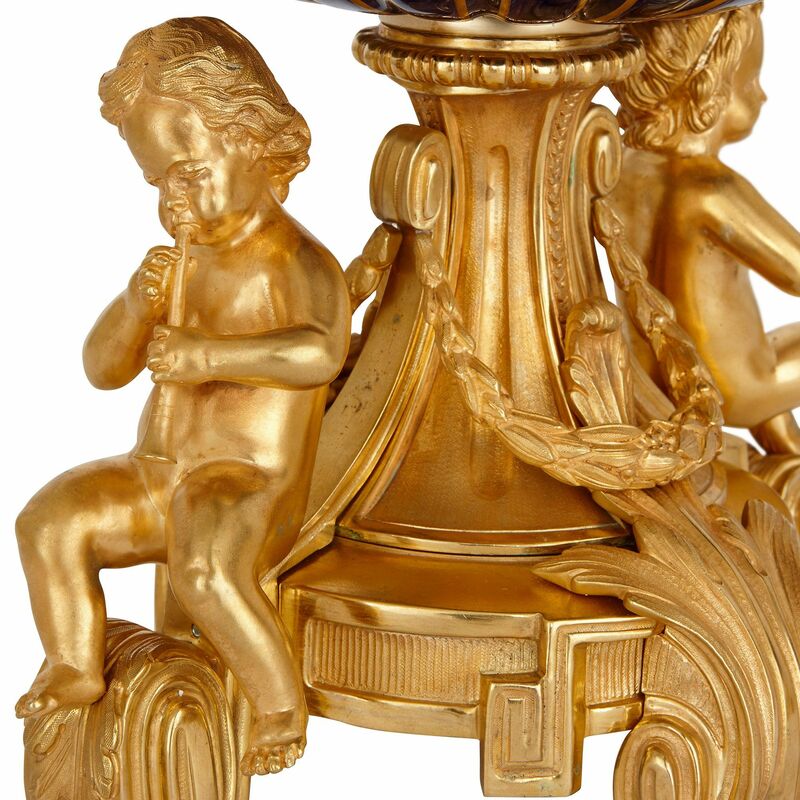 They are set upon intricately scrolling ormolu bases with acanthus leaves and twin putti, who sit upon the feet playing musical instruments. 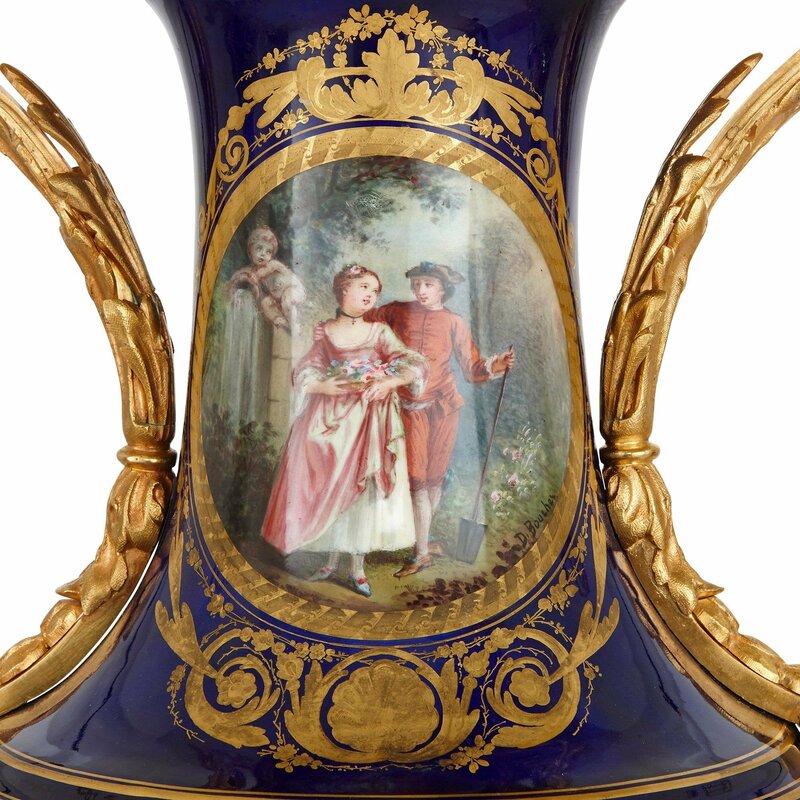 The central vase is mounted to the front centre with the circular clock dial, which is bordered with a beaded, laurel leaf, ormolu rim surmounted with a bow. The clock dial is delicately decorated with a central motif of flowers, ribbons and doves, which is surrounded by black Roman numerals. 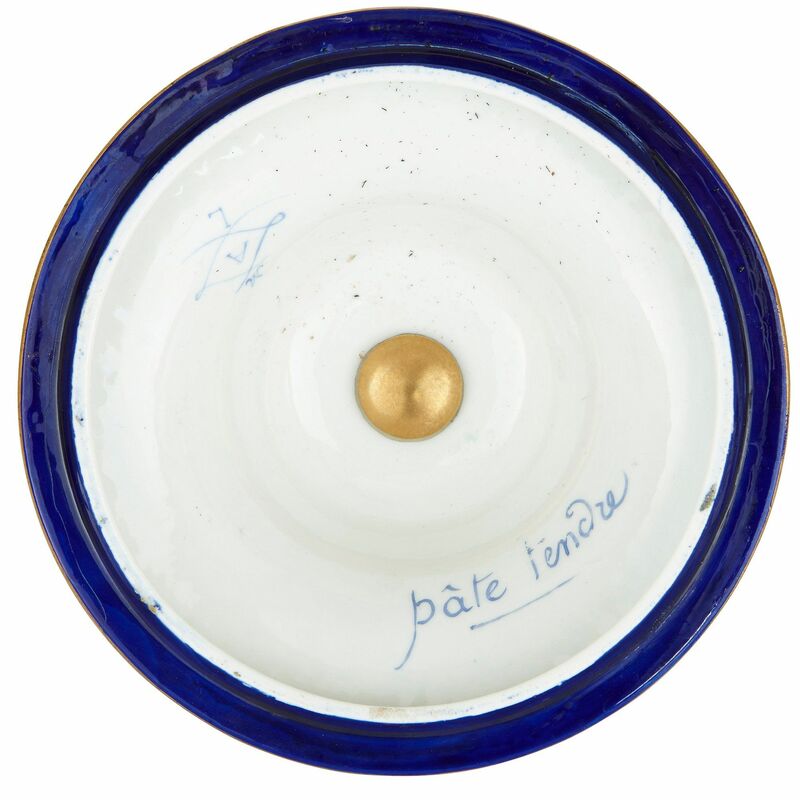 The vases are marked and signed in a variety of places. 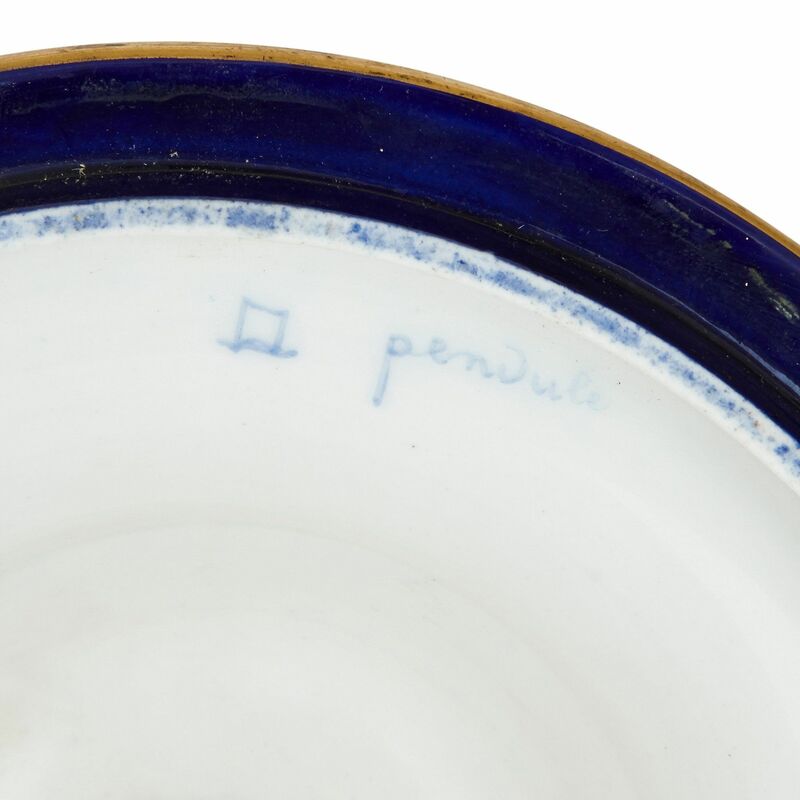 The lid of the clock is distinguished by the inscription 'pendule' under the cover, whilst the pair of flanking vases are marked under their lids with interlaced 'L' marks for Sevres and inscribed 'pate tendre' for soft paste porcelain. 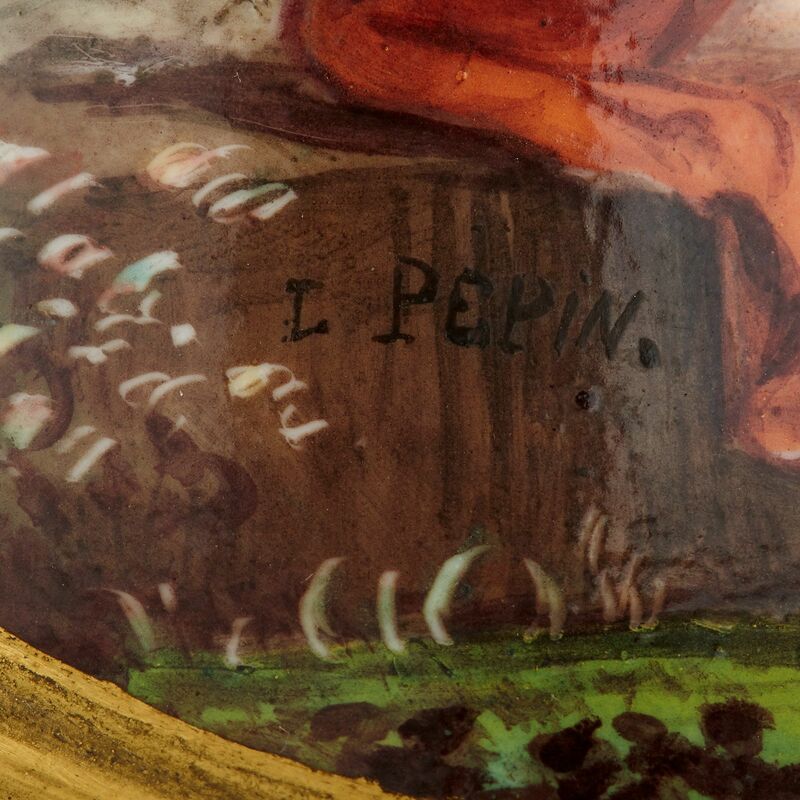 The painted scenes also bear several signatures for 'I. Pepin' and 'D. 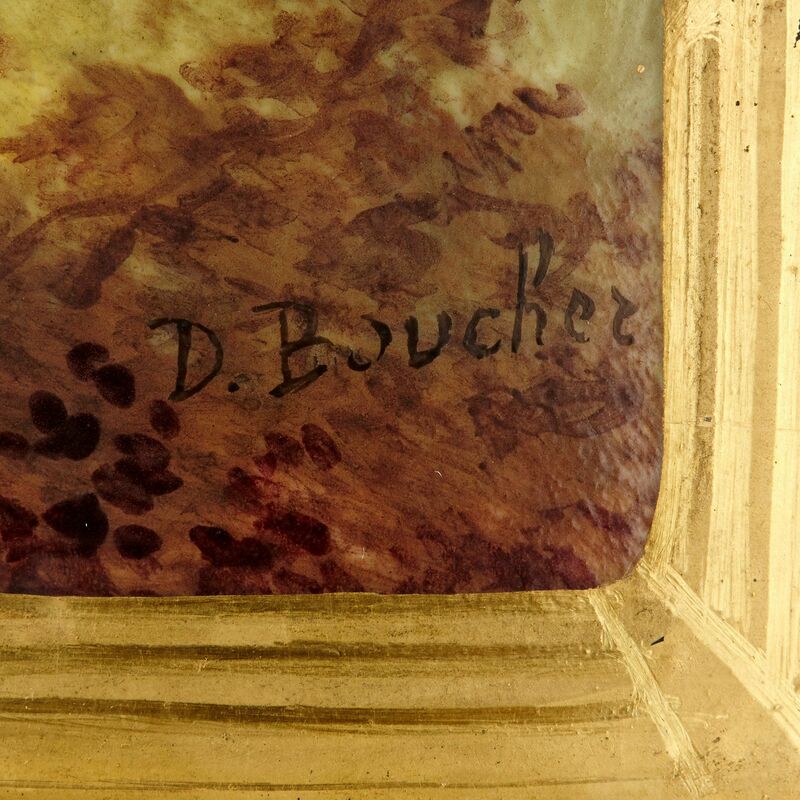 Boucher', the two artists responsible for the expertly depicted scenes. 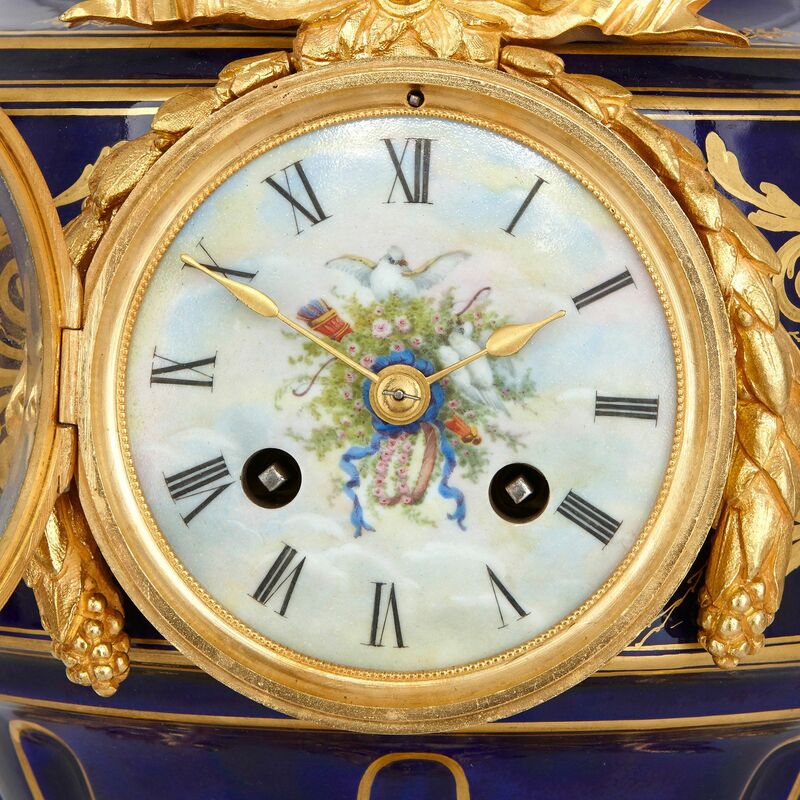 The ormolu mount on the reverse of the clock is also marked 'A. B 1058'.